Woody Woodpecker – Friend or Foe? Woodpeckers are a common sight around our house. We often hear their cackling calls as they fly through the woods or the drumming of their beaks on dead trees as they search for insects. 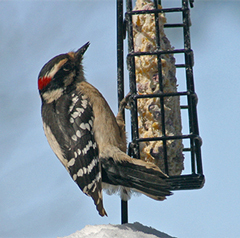 Red-bellied woodpeckers are frequent visitors to our suet feeders as are the little downy woodpeckers. Less common at the feeders are hairy woodpeckers, pileated woodpeckers, flickers, and yellow-bellied sapsuckers. The flickers and sapsuckers normally just come for the water we always provide on our deck. Pileated woodpeckers are really awesome birds. They are the largest woodpeckers in the U.S. (assuming the larger ivory-billed woodpecker is truly extinct). Once in a while, one will fly in to the suet feeder but we normally just see them flying through the woods. These large woodpeckers have a crazy, undulating flight pattern which catches your eye if you happen to be looking in their direction. We usually hear them more often than see them, though. They have a very loud and distinctive “wuk, wuk, wuk” call as they fly through the woods. Almost like something you’d hear in a tropical jungle. Very cool to hear! 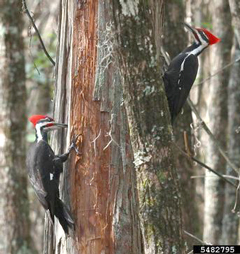 Pileated woodpeckers also make their presence known by the loud hammering sound they make as they drill powerfully into dead trees in search of their favorite food, carpenter ants. I’m happy for them to eat all the carpenter ants they can find! They create a very characteristic rectangular hole as they peck, shred, and tear away at the rotten wood, usually leaving a pile of wood chips at the base of the tree. Most other woodpecker species excavate holes that are round rather than oblong. Last fall, we watched a male pileated woodpecker chip away at the base of a large dead pine in our yard. We had had the tree cut down years ago but asked the tree company to leave about a 20-foot stump – just for the woodpeckers. I guess the woodpeckers, insects, and the weather finally took a toll on the stump because a few weeks ago, it just fell over and rolled down the hill! Most woodpeckers do not damage live trees. They normally feed on trees that are already dead or those that are so heavily infested with insects that they soon will be. 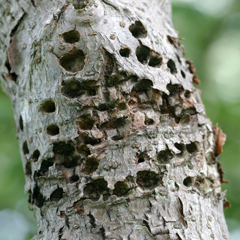 Like the nuthatches and brown creepers, they sometimes feed on insects living in the bark crevices of live trees but this usually doesn’t harm the tree. Nest cavities are generally excavated in dead trees. If you want to encourage woodpeckers, leave some dead trees standing in your woods – as long as they are not a threat to anything or anyone when they eventually fall. One group of woodpeckers, the sapsuckers, is an exception. 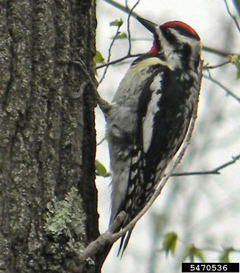 These destructive woodpeckers drill a series of small holes in the bark of live trees and feed on the sap that pools and flows from the holes. They have a specialized tongue for lapping up the sap. Sapsuckers also feed on small insects that are attracted to the sweet sap but unlike most other woodpeckers, their main food source is tree sap. 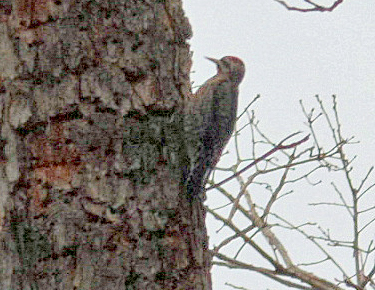 The yellow-bellied sapsucker is common in our area. It is similar in coloration to the downy and hairy woodpeckers but is between these two in size. Both the male and female have a bright red crown on top of their head which distinguishes them from these other two species. 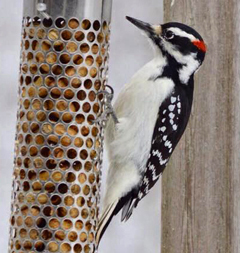 Male downy and hairy woodpeckers have a black crown and a red patch on the back of their head not on the top and the females have no red markings at all. Male yellow-bellied sapsuckers also have a bright red throat. I’m just telling you this so you won’t blame these other woodpeckers for the destruction caused by sapsuckers! 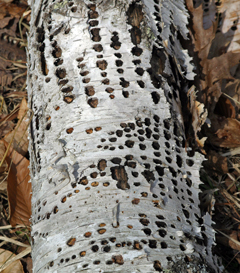 Sapsucker holes are drilled very close together in horizontal or vertical rows. The pattern is very distinctive. They can kill a tree outright if they drill enough holes to girdle it. 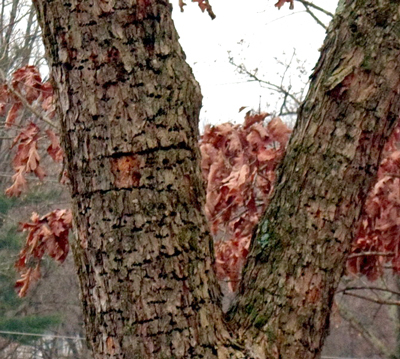 At the very least the holes are unsightly and can also provide a pathway for disease and insects to enter the tree. Though yellow-bellied sapsuckers feed on many different tree species, they are partial to birch and maple trees because of the high sugar content of their sap. 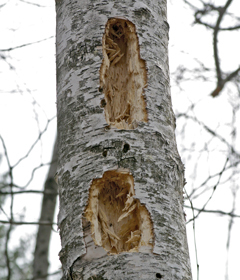 There are quite a few white birch trees on my mom’s property in Vermont that have sapsucker damage and my sister has problems with them damaging the birch trees she has planted in her landscape. 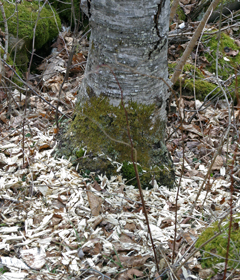 birch probably led to its death. There are a few things you can do to try and stop sapsuckers from drilling into your trees. One method is to wrap burlap around the trunks where they are actively drilling holes. My sister has done this and it has helped to some extent. Hanging visual repellents like flashy CD’s, pie tins, or hawk silhouettes from branches of the tree being damaged has also been known to work. These birds are protected by the Migratory Bird Treaty Act so lethal control methods are not an option. All-in-all, woodpeckers (except the sapsuckers!) are pretty nice to have around because they eat many of the insects that are destructive to our trees. They dig out borers, beetle larvae, carpenter ants, and feast on many of the foliage eating caterpillars. I would say they are “friends”!